4 Comments Published by Cedric Benetti on Sunday, November 16, 2008 at 11/16/2008 08:04:00 PM. 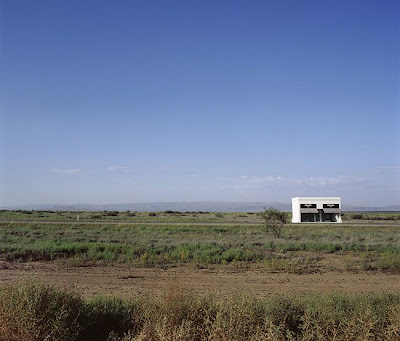 In the middle of nowhere, amidst a desolate stretch of dusty highway outside the Texas town of Marfa (pop. 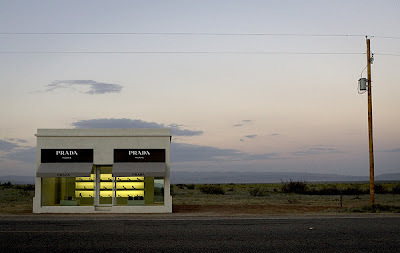 2,121), a solitary new-century white cube emerges from the desert, disguised as a PRADA shop and created in 2005 by Berlin-based artists Michael Elmgreen and Ingar Dragset. 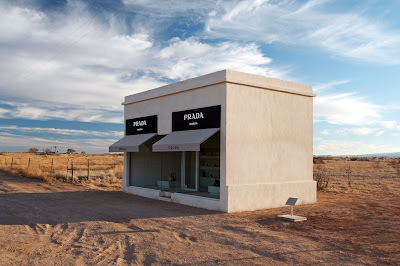 The fake shop comes complete with actual Prada shoes and bags from the Fall 2005 collection displayed in the window. Scared of vandalism, the structure is under video surveillance. Who would want to steal those shoes? Honestly, which fashionista that takes herself seriously would want to get these out-of-season (2005? good lord that is so yesteryear) shoes? And what if someone breaks into this shop? will the police be there in less than five minutes? are they hiding under a quite large rock next to the shop? If so, why don't I smell doughnuts around here? 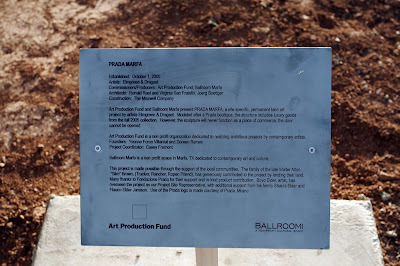 Love Marfa! Moved from that area 12years ago and long to return. It is a totally magical desert mountain area which stimulates every creative gene in my body! Thanks for sharing the pictures! You just made my day! Too perfect. 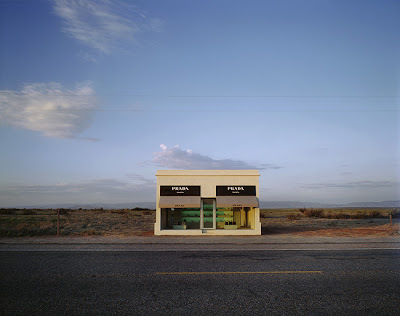 So Marfa. How did I miss it? I looked everywhere!